Some elections just don’t generate much excitement. That was the case in Putnam County during the 14-day early voting period that ended yesterday. Of the handful of contests that appeared on the county general/state primary ballot, few were contested. Not surprisingly, voters stayed away in droves. But that didn’t mean things weren’t hopping for full-time staff and temporary reinforcements, myself included, who worked at the Election Commission office the last two weeks of July. We took care of the two thousand-and-something voters who did show up, a few of whom asked if they could go ahead and vote for President while they were there. (They couldn’t.) We prepared materials for all the workers at all twenty-four precincts that will be open on Election Day, August 4, from 9:00 a.m. until 7:00 p.m. That’s a whole lot of photocopying, stapling, assembling and date stamping. Once we finished with those tasks, we turned our attention to getting the office in tip-top shape. Out with the old and in with the new. Lots of paperwork had to be filed. Lots of stuff had to be purged and lots of stuff had to be shredded. The shredding fell to me. The state recently made changes to the Mail-In Application for Voter Registration, which meant all the old forms needed to be destroyed so they wouldn’t get mixed up with the new ones. The heavyweight manila pages–perforated, hole-punched and bundled in shrink-wrap–were stacked on a cart, waiting to be shredded. Twenty-two hundred of them. Clearly, I needed to formulate a battle plan. 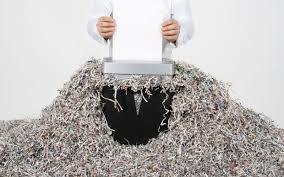 How many sheets could I feed into the shredder at once without choking it? It seemed like a waste of time to count the forms out one by one, so I grabbed a stack about a quarter-inch thick and thrust them into the slot. The shredder, which roars loudly even when it’s not angry, made a dreadful noise. Then it spit the forms, their edges looking like the warped teeth of a comb, back at me. So much for not counting. I stacked four forms into a neat pile and fed them in vertically. No problem. So I fed in four more, four more, four more. But then I began doing the math in my head. I would have to count and feed 25 separate stacks of forms to complete a package. Twenty-five feeds multiplied by 22 packages equaled…I paused my shredding, grabbed a piece of scrap paper and a pencil and went to ciphering. Five hundred fifty. My hands and back began to ache just thinking about it. Surely I could be more efficient than that. Could I, perhaps, shred five forms at a time rather than four? I tried it. Yesss!!! The shredder accepted them without spitting a single scrap of paper back at me. With that success under my belt, I wondered if I could make the process even more efficient by turning the forms horizontally. That worked, too. But after a while, the shredder began making a grinding noise. It was time to oil it. After that was done, I figured I might as well check the plastic bag inside the cabinet to see how full it was. Yikes. It held a mountain of shreds so high they had popped off the rubber band that held the bag to the metal frame and spilled over onto the cabinet floor. Meaning I had to go fetch a broom and dustpan and start sweeping. Eventually, after lots of trial and error and too many hours to count, I managed to successfully pulverize all 2,200 obsolete forms. Five enormous bags full. And that, dear reader, is how I earned the title Queen of the Shredder at the Putnam County Election Commission.